Hearing loss can be defined as any interruption or disturbance in the transmission of sound waves from an external source through the ear structures to being interpreted and understood by the brain.It is estimated that almost half of those over 60 years of age in the UK are suffering from some degree of deafness, and that around 9 million people in total are hard of hearing or deaf. The main cause for deafness is due to gradual deterioration that comes with age, though this does not mean that the numbers of sufferers from other types of deafness are particularly low. There are three types of hearing loss, these are called conductive hearing loss, sensorineural hearing loss and mixed hearing loss. Conductive hearing loss refers to deafness that is caused by the failure of sound waves to be effectively transmitted through the outer ear to the structures of the middle ear. Examples of conductive hearing loss include having a foreign body present in the ear, a build-up of earwax, ear infection, allergy, colds and congestion, or an abnormality of the anatomy of the outer and middle ear. Sensorineural hearing loss is given to deafness caused by a problem within the inner ear or involving the nerve pathways to the brain. 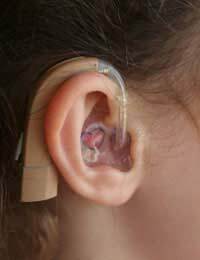 Examples of this type of hearing loss include disease, birth defect, reactions to some drugs and genetic factors. The last type of hearing loss, mixed hearing loss, is given when a combination of the other two types is included, and damage has occurred to the structures of the outer, middle and inner ear structures; this could be due to injury. The most obvious sign of hearing loss is an inability to hear certain sounds. This loss usually concerns either particularly high-pitched frequencies or low-pitched sounds. There may also be difficulty in hearing conversation when there is a lot of background noise and sounds cannot be distinguished properly. These symptoms may appear quickly, such as with an infection or after an injury, or may gradually deteriorate over time. Many people will withdraw from society and social situations or finds themselves turning up the television or radio in order to counteract their hearing loss; both of which are signs or untreated hearing loss.Any type of hearing loss should be mentioned to your GP who will normally refer you to a ENT specialist (otolaryngologist), an audiologist or an audiovestibular doctor who can all make a proper diagnosis using a combination of a physical examination and tests using specialist sound equipment, some electronic, and can treat as necessary. Hearing loss is a very common disorder, particularly for those in the later stages of their life. Technology however, is improving all the time with new research and there are a great many products available to help those whom are hard of hearing to adjust to their circumstances. Always seek advice from a professional regarding purchase of a hearing device as many that are sold in magazines and newspapers are not hearing aids tailored for a specific problem but simply an amplifying device. @Mim - this is a tricky one to give advice on because so much of it depends upon the symptoms you are suffering from as a result and the treatment you will be undergoing. You really are best talking to your GP and/or your consultant as they will be the best people to give recommendations for the interim. I have been diagnosed as having a benign neuroma on an auditory nerve. I am due to return to see the specialist early next year to check the growth or otherwise of the neuroma. is there a particular hearing aid type that might resolve my current hearing problems, please? Very informative! Thanks to the many who put this together!